Each of our pieces is unique and carefully photographed. If you are a regular customer, lets just say, we will be much more generous. Thanks for doing business with Perry Null Trading Co! Please make sure that you are satisfied with your order before proceeding to checkout. We cannot combine or add to any order once checkout has been completed. 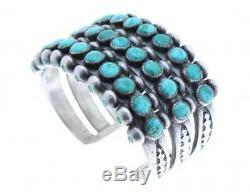 Antique Collection, Navajo Number 8 Turquoise Row Bracelet, Circa 1950s. It is always interesting to see what different collectors want when it comes to their Native American art. You will find collectors who look exclusively for the old stuff, and then some who just want the new creations. Many times the collectors who want the new pieces acquire work from artists who make revival silver, pieces that look like the old. You just can't recreate a bracelet like this fascinating piece. 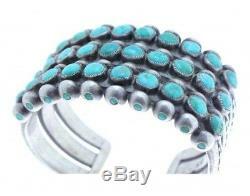 It has three rows of Number Eight Turquoise that has changed from a blue to green, from age and wear. 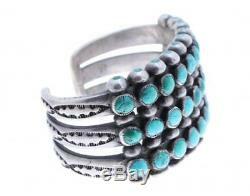 All three rows sit on a heavy Navajo silver construction that reveals deep stamp designs down each end. One of the best things about the bracelet is the turquoise inlay on the side beads, a perfect touch to a historic work. Item Weight: 152.4 grams. Widest Point on Bracelet: 1.5. Cuff Gap Size: 0.9. 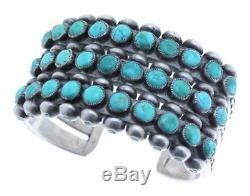 The item "Antique Collection, Navajo Number 8 Turquoise Row Bracelet, Circa 1950s" is in sale since Saturday, January 27, 2018.